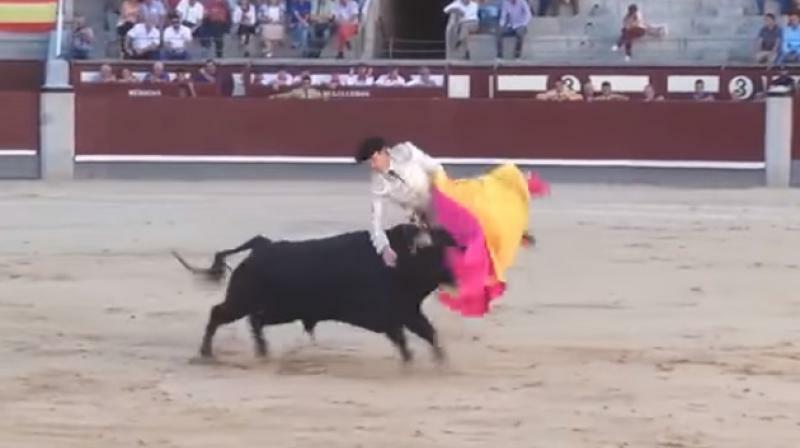 Spaniard Juan Miguel gets attacked by bull at Plaza de Toros de las Ventas. Bullfighting, though considered one of the most popular sports in Spain, is not exactly a walk in the park. The video shows just that. Two bullfighters were seriously injured during a Spanish festival after being gored by the same bull, one of them in his lower abdomen. Spaniards Juan Miguel and Frenchman Andy Younes were warming up for more experienced matadors in the Plaza de Toros de las Ventas in Madrid when horrifying footage shows Miguel, being charged by the bull which is seen goring him in the scrotum and the neck. It turns out that shortly after the video was shot, Andy too was gored by the same bull in both thighs and ankle. Video shows the horrifid crowd watching the entire thing as the mighty black bull drags and tosses Miguel before he can manage to escape from it. The bull throws Miguel several times in the air and then continues his attack on him when he falls down to the ground before Miguel can limp away to safety.